To help lower monthly stormwater fees and the capacity for runoff generation at the Mount Olivet Cemetery in Washington, D.C., the Catholic Archdiocese of Washington (D.C.) has partnered with the D.C./Maryland chapter of The Nature Conservancy (TNC; Bethesda, Md.) to build more than $1.5 million of green stormwater infrastructure on the property. Mount Olivet Cemetery is the largest Catholic burial ground in the District of Columbia. With more than 4 ha (10 ac) of impervious access roads, owners of the cemetery were subject to significantly higher fees under DC Water’s (Washington, D.C.) impervious area charge. The cemetery is now the sight of a “proof of concept” partnership focused on reducing impervious space with the help of private funding and public programs. Daniel Lobo/Creative Commons. In 2013, DC Water (Washington, D.C.) broke ground on a $2.4 billion, 20-year project intended to sharply decrease nonpoint source pollution. To fund the project, the utility began levying significantly higher fees on ratepayers and property owners, including gradual increases to the impervious area charge it introduced in 2009. The initial charge was $1.24 for every 93 m2 (1000 ft2) of impervious cover on each property. In 2018, that charge has risen to $25.18, and DC Water has indicated that the charge will continue to increase as the project progresses. 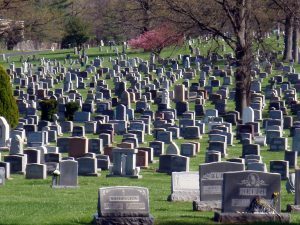 To avoid an annual fee of nearly $140,000 for the system of paved access roads covering more than 4 ha (10 ac), the Mount Olivet Cemetery has sought green infrastructure options, reports The Bay Journal. In fact, the cemetery’s plans will surpass the city’s minimum requirements and generate stormwater retention credits that can be sold as a new revenue stream. The first phase of green-infrastructure construction at Mount Olivet was completed in December 2017. TNC consultants oversaw the retrofit or replacement of about 1670 m2 (18,000 ft2) of impervious pavement with bioretention cells, rain gardens, and other water-retaining features designed to absorb up to 4.3 cm (1.7 in.) of rain in a 24-hour period. In close cooperation with the Archdiocese, project planners kept access to the cemetery fully open during construction, avoided disturbing graves, and chose to install plants that attract pollinators, adding to the cemetery’s peaceful and reflective atmosphere. Designs were chosen based on the cemetery’s unique topography and soil composition as well as the ease with which the cemetery’s groundskeepers can maintain them. As opposed to pumps, pipes, and more complex green infrastructure, maintaining rain gardens and bioretention cells usually is as simple as watering plants and removing debris. TNC, in cooperation with New York City-based investment firm Encourage Capital, last year established a new entity focused on helping Washington, D.C., prioritize effective stormwater management. District Stormwater LLC (Washington, D.C.) received an initial investment of $1.7 million from Prudential Financial (Newark, N.J.) for the Mount Olivet project, which stakeholders hope will “serve as a model project for other landowners and developers” subject to heightened stormwater management fees, says Kahlil Kettering, urban program director for the local TNC chapter. By retrofitting or replacing little-used access roads at Mount Olivet Cemetery with green stormwater infrastructure that includes native plants, the partnership between The Nature Conservancy’s D.C./Maryland chapter (Bethesda, Md.) and the Catholic Archdiocese of Washington (D.C.) adds aesthetic value to the property while also minimizing runoff. David Gray/U.S. Army Corps of Engineers. 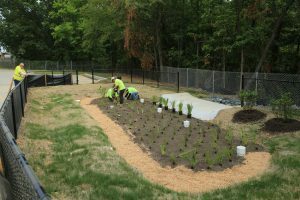 After the first phase of the Mount Olivet project, the cemetery now surpasses the minimum stormwater management requirements mandated by the city. Through D.C.’s Stormwater Retention Credit Market, which was established as the nation’s first exchange program of its kind in 2013, the Archdiocese can translate its extra stormwater retention capacity into about 270,000 sellable credits. When purchased by other developers and landowners, these credits can be applied toward their stormwater management requirements while bringing a new revenue stream to the cemetery. If proposals are agreed upon by the Archdiocese, TNC, and investors, future construction phases will generate additional credits for the cemetery while further reducing its impervious area. Stormwater runoff from Mount Olivet Cemetery drains directly into a tributary of the Anacostia River, which in turn flows into Chesapeake Bay. DC Water notes that over 11.3 billion L (3 billion gal) of runoff and sewage enter the Anacostia and Potomac Rivers each year, making D.C. the fastest-growing source of pollution in the watershed. Tags: bioretention, cemetery, Chesapeake Bay, Clean Rivers Project, DC Water, Green infrastructure, Mount Olivet, Rain garden, stormwater credit trading, The Nature Conservancy, Washington D.C.